﻿ ukher.com gorgeous Curly Hairstyles copy their Curly style and glamour. To make Curly hair work for you, it needs to be styled with your individuality in mind. To play to your own hair strengths and enhance your best features. 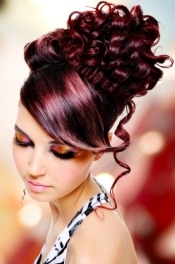 Your stylist can help with the magic, just print out your Curly hairstyle or show them on your phone/tablet.